Somerville Borough Hall is located at 25 West End Avenue, Somerville NJ 08876; phone: 908-725-2300. Photo: Wallace House, ca. 1778, 35 Washington Place, Somerville, NJ. John Wallace was a merchant and fabric importer in Philadelphia. Listed on the National Register of Historic Places in 1970. Photographed by User:Author:ekem (own work), 2005, [cc-by-3.0 (creativecommons.org/licenses/by/3.0)], via Wikimedia Commons, accessed February, 2013. There were at least three farm houses in the vicinity as early as 1683, yet it is not one of the oldest towns in the county. It was first known as Raritan, then the Court House. The present name when first proposed was not popular. It was considered too fine, or fanciful, and it took a long time to reconcile the popular mind to its use. Bound Brook, Millstone and Pluckamin are all older in point of time. In the times of the Revolution there were only two houses within the present limits of the village. One was known as 'Fritt's Hotel,' and the other was long-called 'Lower Tavern.' 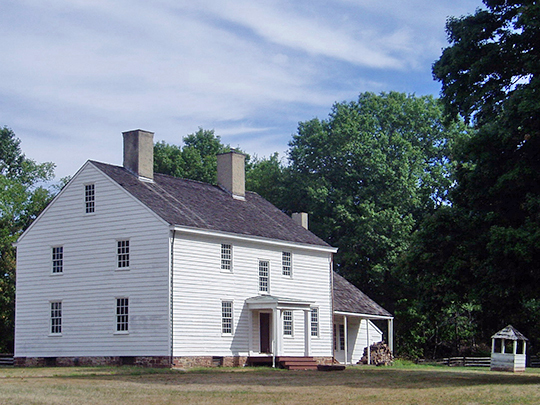 A parsonage was built by the Reverend John Frelinghuysen in 1751 and 1752. After the destruction of the Court House at Millstone by Colonel Simcoe, October 18, 1779, the seat of justice was removed to Somerville. In 1789 affidavits in the Orphan's Court were taken by Frederick Frelinghuysen as Surrogate at Millstone. In June, 1794 there was a Court of Common Pleas setting in Bridgewater, the Judges being Robert Stockton, Robert Blair, Nicholas Duboise, John Stryker, and Archibald Mercer. The removal must have taken place between these two dates. Precisely when Somerville received its name is unknown. The oldest documentary evidence dates July 18,1801. After the Revolution the extreme admiration for everything French, excited by the aid extended to our struggling colonies in their efforts for independence, made it almost a necessity to have a "ville" attached to the name of every town however insignificant, and so the county seat of Somerset, came naturally to be called Somerville. There was an early Post Office opened in the village kept by Mr. Meldrum, and a semi-weekly mail from New York. Probably this had a final effect in bringing the name into general use. In the time of William Mann, it was kept in his bar, the whole business amounting to some dozen letters a week. The first thing which really assured prosperity and growth was the fact that in 1778 the Raritan congregation determined to build their church here. It was the first church in the county pretending to any excellence and expense. In 1809, John Davenport, who owned one hundred acres of land fronting on the main street in Somerville, had it divided off in lots and streets in the form of a village, and disposed of the whole in the form of lottery. Every ticket costing thirty dollars was assured to draw a prize, and fortunate ones might become entitled to the house in Somerville, or to one of the lots fronting on the main street. Most of the tickets were sold in New York; some of the land itself was thrown out to become a village common known as the "Lottery Field." About 1808 the need of books being much felt, an effort was made to establish a public library in the village. Quite liberal contributions were made for that day, and a respectable number of books were purchased, a book case procured, and they were kept in Mr. LaTourette's store. Abraham Messler, D.D., Centennial History of Somerset County, C. M. Jameson, Publisher, Somerville, 1878.